For students, the transition between primary and post primary can be rather daunting especially with increased numbers of subjects and the introduction of foreign languages i.e German, French etc. This has been highlighted in recent years, with primary school teachers placing a greater emphasis on preparing their pupils for this transition. With this in mind, we the Transition Year students studying German in Ms.McNeill’s class were thrilled with the announcement of this 6 week German initiative set up by Ms.McNeill and Ms. Joyce of St.Colman’s National School, Mucklagh . 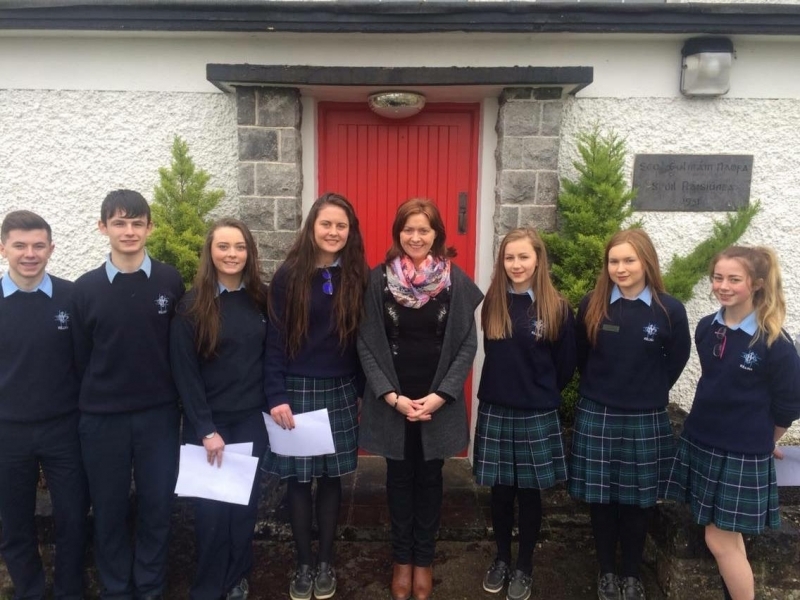 After an application process, 7 students were chosen to help the 6th class pupils of St.Colman’s with their transition by teaching them basic German such as greetings, numbers 0-20, days of the week and months, colours, basic family, the description of oneself and hobbies. Preparations for this initiative began in September, with the 7 selected transition year students preparing lesson plans for the initiative under the helpful guidance of Ms.McNeill. Within our preparation time we were taught about classroom management and what it entails to be a teacher. This was a great insight into teaching and is beneficial to us as we all are considering teaching as a career path for 3rd level. This initiative began on the 15th of January 2016 and will run until the 4th of March 2016. To date, we have been extremely happy with the progress of this programme. Working in pairs we have delivered the first two of our lesson plans to the 6th class pupils who are enthusiastic and eager to learn German. This initiative would not be as successful as anticipated without the support of many people. It would not have been possible to run this initiative without the help of our school principal Mr.Cotter and also our German teacher Ms. McNeill who and gave up a vast amount of her personal time to assist us with lesson plans and also for providing us with her wisdom and experience. The support of Ms. Joyce , principal of St. Colmans, and Ms. Ni Thuama was invaluable as they were so eager to take part in this initiative. We are extremely thankful to PDST and especially Rachel Farrell, deputy director of PDST , for kindly assisting us financially and for supplying us with the resources required during this initiative. On behalf of myself and my classmates involved we are honoured to be part of the initiative and we will definitely look back on this wonderful experience as the highlight of transition year.